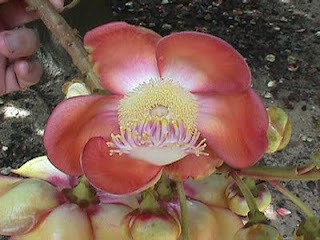 Cannonball tree - another ludicrous flower to enjoy! While clearing out lab space the Phactor happened upon a box of ol d 3.5” disks (Hey, there are still boxes of 5.25” disks around here too.) that were used as the file storage medium for the 1st digital camera our department ever purchased. And they were filled with images from the tropics, and although now looking a bit low in resolution, such images are not easily replaced. It’s been awhile since the Phactor had a good ludicrous flower for you to enjoy, so here’s the flower of Couroupita guianensis, the cannonball tree. As you may judge from the fingers (upper left), the flower is pretty large, some 5-6 inches across, and rather luridly colored orange-red, and not of the usual floral organization. The petals are not equal and in a nice regular whorl. The thing that looks a bit like a sea anemone is an androphore, a structure that bears anthers, and the rather thickish anther filaments are lavender. The furry-fuzzy disk behind is composed of sterile anthers with a single pistil in the middle that develops into a hard, cannonball-sized (6-8" diam) fruit. Like many tropical trees, this one produces flowers on its trunk rather than among its leafy branches, but this tree grows a mantle of leafless, twisty-turny dangling branches upon which flowers and fruits are borne. While a native of the neotropics, cannonball tree has been planted around the tropics as a curiosity. Having discovered him during my college years (yes, the Phactor was a student of the 60s), Garrett Hardin remains one of my favorite essayists. He always clearly saw the problem: human nature. One of his more influential and insightful essays, “The tragedy of the commons” (1968) pretty well explained why an ever increasing human population is destroying the commons: over fishing the seas, over harvesting the forests, over tilling the soil, over pumping/diverting the water, over polluting everything, etc. So how to subvert basic human nature? Well, ask a psychologist, of course! Barry Schwartz writes a very thoughtful article, “Tyranny for the commons man”, on this subject that is well worth reading. A long time ago a previous owner of my estate planted quite a few shrubby dogwoods, and they grew quite well, and as is their nature, the twigs rooted wherever they touched the ground, and they grew quite well, and so on. At present they cover considerable areas beyond the original shrub, and previous encounters proved that removing said dogwoods is a considerable task, one not to be undertaken in just any mood. But this weekend the Phactor got annoyed at the dogwood takeover of a pathway (it disappeared) and their encroachment on firs and newer flowering shrubs. So with only the zeal that a truly annoyed gardener can muster, my fury was unleashed upon the dogwood thicket with loppers and chain saw, and a couple of hours later maybe one-third of the dogwoods were gone, which is a bit depressing, but at least one-third of the thicket was transformed into piles of brush that needed to be dragged to the curb for recycling. So what do joggers have to do with this? Well, all those piles of brush, load after load, were over 300 feet from the curb. And so trip after trip, pile after pile, the mass of dogwood brush was relocated, and near exhaustion, filthy dirty with sweat, sawdust, and debris, some joggers jogged by all in their neat little outfits, unstained joggers, and barely damp head bands, and as they moved by, one said, "What a mess." Now they were either referring to the Phactor himself, or the tall piles of brush, or both, but either way, my mood was not improved. Clearly joggers do not garden on any scale larger than a window box and would probably faint at the sight of soil (not dirt) beneath a finger nail. Gardeners don't job because we don't need for any more exercise. Jogging is effort expended where nothing is accomplished except for bounding development of a narcissistic glow of personal accomplishment. Joggers, how about mowing the lawn of some senior citizen in your neighborhood? How about spading their garden? How about raking their leaves? How about finding a senior citizen and dragging his dogwood brush a total of about one-half mile (piles x distance) ? Then we'll see whose sweaties look so nice and clean, if you should last that long. Margaret and Helen are a couple of bloggers that make the Phactor feel downright young, which he most decidedly isn't. You have to feel good about two 80+ year old women commenting on current events, and offering a bit of perspective. With respect to the "angry" mobs demanding to have their country back, "I fear that the America they want back is the one where black men don’t become President." Oh, the Phactor thinks the girls have hit the nail right on the head. Anyone who is any kind of gardener at all exchanges plants with other gardeners. Most the Phactor is on the supply side of the exchange, but even with all my connections, opportunities are limited, and just perhaps with a wider of contacts, somebody might have something to exchange that does not already grow in my expansive domain. Here's a new web site promoting plant exchange for gardeners. It looks to be pretty sparse at present, but be some good folks, sign up and see how it works, and report back. Anyone want some creeping Charlie? HT to the Botanical Society of America. For nearly 19 years this cat allowed the Phactor to live in his house and serve him his food. 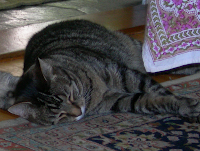 A true cat's cat, this image shows him in a "good cat" phase, asleep, and of course, no one was ever present during the "bad cat" phases because true to the CAT CODE, rules scrupulously followed in your presence were totally ignored in your absence. Baskets were there to be dumped in search of interesting contents. House plants were for those between meal snacks. Oriental carpets were for barfing up afore mentioned house plants so as not to soil the floors. And out of consideration for our guests, all snacks and edible items placed out on tables must be sampled in full view. Hmmm, crackers; hmmm, pie crust; hmmm, cheese cake; hmmm, vanilla ice cream! He got yelled at so many times his full name got shortened to a single syllable with an exclaimation point permanently attached: Alex! Alex! found it saved time and energy to go full tilt in as straight a path as possible between where he was and his intended destination, so why would anyone be so inconsiderate as to place vases, lamp, or plants along one of these paths? All of this energy was packaged into a football-shaped plush tiger covering, and although it did not look possible, it all could be wedged into the space between you and the arm of a chair or couch. And his bulk helped anchor your feet at night. Alex! retained his vigor well into his golden years looking many years junior to his true age. The years finally caught up to him, and he'll be missed, not only as a part of the family, but as a role model for cats everywhere. This is amazing! The Phactor has a thing for trees and has seen some great ones over the years, but he's never seen anything like these foot bridges literally grown from the roots of figs. The roots of figs can produce some amazing growths like one that I featured in a blog commemorating a friend, but this "green technology" would be something to see. It's on my bucket list for sure. Those of us whose lives revolve around academia, especially those of us who actually do the work of educating, which almost universally means faculty on nine month appointments, march to the beat of a different drummer, the academic calendar. My point here is not to criticize the calendar, or the 2nd associate assistant vice president whose pitiful job, even though certainly making more money than yours truly, it is to construct this dictatorial beast. So, no cheap shots will be taken. Besides if you start criticizing the calendar twerp, then the monkey who does the campus directory, the one that requires that you know the university's complete organizational chart to find anything, would take a drubbing so severe that it would actually generate sympathy for them, and that would detract from my postitive energy. Although August is a funny time for a new year, it deserves some celebration, just like New Year's Eve revelries on the Georgian calendar, and most certainly we celebrators of the academic new years often have a drink or three on this hallowed eve. Actually the Phactor likes these beginnings because everyone starts out in anticipation of so many good things happening, and it takes several weeks, about the time of the first exam for the rosy glow to fade a bit, when both parties begin to face the realities that success takes some effort and that not everyone expended as much as required. But that is part of the job. Ah, but that's then and this is now, and the energy and excitement are something to be enjoyed, although the week immediately before classes is something to be avoided altogether, if possible, because our small city becomes a mad house, as would any municipality whose population increases by 50%, and only in the 18-22 year old category, virtually overnight. So come next Monday my students will be told that they start my courses fully able to grasp an A, and that my expectations are that they all will. And that is the wonderfulness of new years, a time to set aside the certain knowledge of what will happen, and to hold out hope that this semester will be THE semester when all my students achieve what they are fully capable of achieving if other things did not get in their way. The sad reality is that even reality shows can be a higher priority for some than the best botany course ever. Still some of them will achieve this, even to their own surprise, so the Phactor can still be optimistic and still look forward to new beginnings with new people after so many years in the business. Happy 41st new fall semester from the Phactor. Let's hope it's a good one. What did sauropods have for breakfast? One of the more creative presentations at this year's recent botanical meetings was a study on sauropod herbivory by Dr. Carole Gee. Since sauropods were the most massive animals to ever live on land, they had to eat a lot (hundreds of kilos a day) and they were strict vegetatians (herbivores). Presently the largest land animals either eat grass, e.g., bison, or browse tree leaves, e.g., giraffes, and these are all flowering plants now. But back in the Late Jurassic (152 million years ago) the choices were very different and no body had ever thought about the different energy contents of the plants sauropods had to choose among. Many of the prominent groups of plants from the Late Jurassic survive today, horsetails, ferns, ginkgoes, diverse conifers, and cycads, so assuming modern members of these groups still retain the basic characteristics of their ancestors, the energy content per unit of plant mass can be compared. Rather surprisingly horsetails had the highest energy content, even higher than modern grasses. Next came Araucarias (monkey puzzle trees and Norfolk Island pines) and ginkgoes, both actually better food than the leaves of modern forest trees. Another talk provided us with a view of the rather open savanna-like forest structure of araucarias based on large numbers of fossil tree stumps preserved in volcanic ash. A perfect place for large sauropods to graze among the tree tops. Cycads with their tough, hard foliage had the least energy content, and since they are also slow growing, they simply don't produce much leaf material. Today cycads are minor elements of tropical and subtropical communities, but back in the Jurassic they made up about 20%. A couple of ferns with ancient lineages, like cinnamon fern, were pretty good sauropod food, but other more modern ferns have pretty low nutritional levels. So what good is this? Well, curious minds want to know how ecology worked in the past. This query (?) is asked many times a day (30+), and the web site ChaCha provides an answer. After the obvious omission of a question mark, which calls the ChaCha mission into question because after all how can you provide decent, reliable answers if you cannot properly pose the questions, this site provides dreary, lifeless, dictionary type of definitions, which while technically correct, are bereft of the soul and passion that drives botanists. You might as well define beer as a carbonated, fermented hops and malted barley beverage, which while perfectly correct hardly makes you want a cold one. Anyone interested enough in botany to ask this question deserves far better answers. Clearly the one thing they didn’t do is ask a botanist. Our diversity is quite impressive, and while it is technically correct that we botanists study plants and other green organisms, and we are scientists, we are so much more, and some of the nicest people on Earth to boot. So click yourself on over to the Botanical Society of America and see what a bunch of real botanists say about themselves and what they do. Everyone wants to be a botanist, it just takes some people longer to figure this out than others. No nutritional benefit to organic food? A meta-analysis (a study of relevant studies) of the nutritional and health benefits of organic foods concluded that there were no differences between organic and conventionally produced foods. This makes perfectly good sense biologically, and as a trained skeptic, the Phactor has always doubted the nutritional claims made by organic foods advocates. Of course this is like putting a stick into a hornet’s nest and stirring because these advocates defend their beliefs with religious fervor. And having once launched a marble through a hornet’s nest with a slingshot (a youthful dalliance), and been chased a considerable distance by the rightfully infuriated horde, the imagery for me remains quite vivid. First, let me go on record as saying conventional production of many foods is often done poorly, and over-use of fertilizers, pesticides, antibiotics, and hormones is just plain dumb and wasteful. Second, the overall quality is mediocre as with any mass produced commodity. Third, no one should have to worry about stuff in their food that shouldn’t be there. Let’s farm smart. To their surprise, students of mine who expressed such worries were unable to find any traces of pesticides in samples of produce in local markets. But we live in an era when unsubstantiated claims are used as scare tactics to influence everything from marketing to politics. This works because the cynics who use such tactics understand that a lot of people just do not think for themselves anymore. Now before the stones start flying, allow the Phactor to say he is a great fan and patron of local organic farmers, but it’s not because of the health and nutritional claims, it’s because their produce is produced with care, picked and sold fresh. In other words they deliver quality goods and deserve a premium price. Back when more conventional production was done locally, on smaller scales, and marketed by the actual producer, the qualitative differences between organic and conventionally produced foods would be negligible. Understand this, spinach does not know or care where its nitrogen comes from, and it makes the same spinach molecules regardless. A soluble nitrate ion is the same to a plant whether from compost, manure, or 10-10-10. And since plant growth and reproduction is limited by available nutrients, making sure plants have sufficient inorganic nutrients is important to production. Without enhanced nutrients, organically produced plant foods may be slightly lower in inorganic nutrients like phosphorus and potassium, but the differences are not enough to alter their nutritional value. The overuse of pesticides, hormones, and antibiotics simply cannot be defended. Bottom line, at present organic produce, when locally produced is quality food, but the health/nutritional claims simply are not supported by any evidence. Big stores now have “organic” food sections, particularly in produce, to compete with local producers, and this strikes the Phactor as an organic food scam.